Quick Questions in the Shoulder: Expert Advice in Sports Medicine provides a unique format of concise and to the point responses with clinical application, backed by the latest research on shoulder injuries among athletes. Dr. Kellie C. Huxel Bliven and her contributors present 39 common clinical questions regarding the prevention, assessment, treatment, management, and rehabilitation of the shoulder. Co-published with the National Athletic Trainers’ Association, Quick Questions in the Shoulder: Expert Advice in Sports Medicine provides concise answers to 39 frequently asked clinical questions. Written in a conversational tone, the authors of the individual questions represent a variety of different backgrounds and are experts in their respective field. The variety of questions and brevity of responses will make this a book that is easy to read and reference at the point of care. oHow does the trunk contribute to upper extremity function and injury risk in overhead athletes? o What are the best clinical tests for determining if a patient has scapular dyskinesis and to determine if it is contributing to their shoulder pain and dysfunction? o What are the most effective glenohumeral mobilization techniques and when are they most appropriate to use to improve shoulder function and range of motion? o What assessments should be used in screening overhead athletes to determine who is at increased risk for injury and what are the most effective injury prevention strategies? 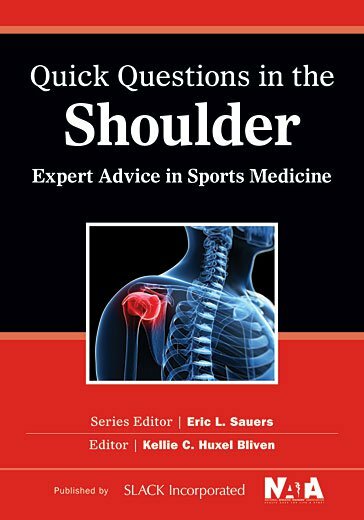 Quick Questions in the Shoulder: Expert Advice in Sports Medicine is the perfect at-your-side resource for the athletic trainer, team physician, or sports medicine clinician looking for practical answers to sports-related shoulder injury questions. The concise and conversational tone allows the reader to readily apply the information into their everyday practice. Question 1 What Factors Contribute to Forward Head and Rounded Shoulder Posture, and Why Is It Important to Assess? Question 2 How Does the Trunk Contribute to Upper Extremity Function and Injury Risk in Overhead Athletes? Question 3 Do Hip Mobility and Strength Affect Shoulder Function in Athletes? Question 4 Can Core Strength and Stability Improve Upper Extremity Function? Question 5 What Are Appropriate Weight Training Exercises to Avoid Shoulder Pain and Discomfort? Question 6 What Are the Most Common Forms of Shoulder Impingement in Athletes, and How Can One Differentiate Between Them? Question 7 What Are the Best Clinical Tests for Determining if a Patient Has Scapular Dyskinesis and if It Is Contributing to His or Her Shoulder Pain and Dysfunction? Question 8 What Is the Clinical Importance of Visual Scapular Dyskinesis in Overhead Athletes With Shoulder Symptoms? Question 10 Which History and Physical Examination Diagnostic Tests Can Confirm and Screen Superior Labral Anterior-to-Posterior Lesions? Question 11 Which History and Physical Examination Diagnostic Tests Can Confirm and Screen Glenohumeral Instability? Question 12 Which Clinical and Diagnostic Imaging Tests Are Most Effective for Diagnosing Rotator Cuff Disease? Question 13 What Constitutes a High-Quality, Effective Clinical Assessment of Thoracic Outlet Syndrome? Question 14 What Is Effort Thrombosis, and How Is It Diagnosed and Treated? Question 15 What Are Common Causes of Cervical Radiculopathy, and What Clinical Tests Can Be Used to Diagnose It? Question 16 What Mechanisms Contribute to Injury of the Peripheral Nerves at the Shoulder, and How Do These Injuries Present Clinically? Question 17 What Is the Role of Musculoskeletal Ultrasound in Diagnosing Shoulder Pathology? Question 18 What Are the Best Patient-Rated Outcomes Measures for Use in Assessing Shoulder Pain and Dysfunction in Athletes? Question 19 What Strategies Can Be Implemented to Integrate Patient-Rated Outcomes Measures Into the Routine Care of Patients With Shoulder Injury? Question 20 What Factors Should Be Considered in the Early Management of a First-Time Traumatic Anterior Shoulder Dislocation? Question 21 Which Types of Acromioclavicular Joint Separations Respond Best to Nonoperative Management, and What Rehabilitation Guidelines Ensure a Safe Return to Play? Question 22 After a Brachial Plexopathy, What Are the Most Important Considerations for Determining When an Athlete Can Safely Return to Collision and Contact Sports? Question 23 What Are Effective Clinical Techniques to Improve the Thoracic Spine Mobility Necessary for Shoulder Function? Question 24 What Are the Best Therapeutic Exercises for Addressing Scapular Dyskinesis? Question 25 What Are the Most Effective Glenohumeral Mobilization Techniques, and When Are They Most Appropriate to Use to Improve Shoulder Function and Range of Motion? Question 26 When Is It Best to Use Muscle Isolation and Muscle Integration Exercises in Shoulder Rehabilitation? Question 27 What Are the Best Nonsurgical Treatment Approaches to Resolve Thoracic Outlet Syndrome and Improve Function? Question 28 What Are the Most Important Range of Motion Restrictions After Shoulder Surgery? Question 29 What Are the Most Appropriate Exercises to Safely Gain Range of Motion Postoperatively With Minimal Activation of the Rotator Cuff Muscles? Question 30 What Are the Most Important Aspects of Patient Education and Home Exercise Programs for Improving Shoulder Function? Question 31 What Assessments Should Be Used in Screening Overhead Athletes to Determine Increased Risk for Injury? If Screening Indicates Injury Risk, What Injury Prevention Strategies Are Recommended? Question 32 Why Is It Important to Assess Shoulder Rotational Range of Motion in Overhead Athletes? Question 33 Is There a Relationship Between Shoulder and Elbow Injuries in Overhead Athletes? Question 34 What Are the Optimal Shoulder Strength Ratios for Overhead Athletes, and What Strategies Should Be Implemented to Ensure Appropriate Strength Ratios? Question 35 What Are the Current Pitch Count Guidelines for Youth, Adolescent, and Adult Baseball and Softball Pitchers, and Are These Guidelines Effective in Decreasing the Number of Shoulder Injuries Experienced in These Populations? Question 36 What Are Important Considerations in Managing the Adolescent Baseball Pitcher With Shoulder Pain? Question 37 What Are the Components of a Safe and Effective Return-to-Throwing Progression for Pitchers? Question 38 What Are Important Considerations in Managing Chronic Glenohumeral Microinstability in the Tennis Athlete? Question 39 Which Training Modifications Can Be Advantageous in Reducing Shoulder Pain and Preventing Shoulder Injury in the Competitive Swimmer? Kellie C. Huxel Bliven, PhD, ATC is an Associate Professor in the Kinesiology Program within the College of Graduate Health Studies at A.T. Still University (ATSU) in Mesa, Arizona. She is also an adjunct faculty member in anatomy for several residential programs at ATSU. Dr. Huxel Bliven earned her BA in biology and physical education from Denison University in Granville, Ohio; her MS in kinesiology from Indiana University in Bloomington, Indiana; and her PhD in kinesiology with an athletic training emphasis from Temple University in Philadelphia, Pennsylvania. Dr. Huxel Bliven has an active research line in the area of dynamic restraint of the shoulder, examining shoulder adaptations in overhead athletes, upper extremity muscle activation during rehabilitation exercises, and health-related quality of life in throwing athletes. Dr. Huxel Bliven serves on the Board of Certification’s Exam Development Committee, is the Associate Editor for the Journal of Sport Rehabilitation, and is an active member in the American Society for Shoulder and Elbow Therapists (ASSET).